A two-day conference, hosted by Spaces for Change in Eket, Akwa Ibom State coincided with widespread community protests against the unpaid N26 Billion Naira compensation for the environmental atrocities committed by Mobil Producing Nigeria (MPN) Unlimited in the state. The aggrieved host communities: Eket, Ibeno, Ona and Esit-Eket are demanding compensation for the numerous oil spills within the state, especially the November 2012 spills which had destructive and deleterious effects on the environment and adversely affected the socio-economic development of the inhabitants of the areas of impact. Among other objectives, the conference, “PIB: Pulling Together for Environmental Justice” aimed to provide a platform for stakeholders in the oil and gas industry and oil-impacted communities to develop and initiate joint action towards transforming local agitations into opportunities for peaceful change, environmental justice and corporate accountability, within the context of the Petroleum Industry Bill (PIB). Local youth and women took the streets, chanting protest songs, mounting roadblocks and banners inscribed with varying messages of fury. As the agitations thickened in tempo and speed, spreading across the four major oil producing communities, Mobil’s gates and facilities remained closed, forcing the company to shut down operational activities. 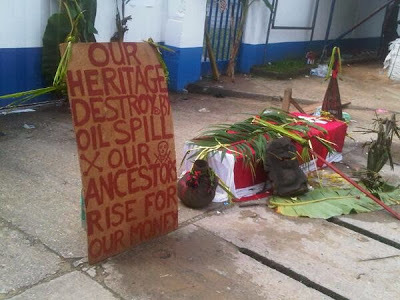 Particularly curious was the display of plantain tuskers, local deities and strange-looking cultural artifacts near the fence of Mobil’s airstrip in Eket, where angry local youth invoked the intercession of their ancestors in the current impasse between the oil conglomerate and the host communities. Between August 13 and December 16 2012, no less than 10 incidents of massive oil spills have been recorded, resulting in adverse environmental impacts on the ecosystem and loss of traditional livelihoods. Despite admitting that the November 9, 2012 spillage in particular, was caused by a rupture in one of its pipelines, compensation remains unpaid several months after the incident occurred. To compound the situation, comprehensive clean-up and remediation of various sites of oil spills in order to restore the natural resources damaged or destroyed, have not yet taken place, constituting a legal infraction for which communities are entitled to legal remedies. Another issue stoking the flame is the imperious manner in which the Akwa Ibom state governor meddled into the compensation dispute between Mobil and host communities contrary to Nigeria’s legal regimes on oil-related compensation. Widespread outrage and resistance greeted the announcement that Governor Godswill Akpabio plans to receive the compensation money on behalf of affected persons and communities, and use the funds to construct roads and other development projects across the largely-neglected oil producing communities. Perhaps most telling is that Akwa Ibom is the only Niger Delta State that has not complied with the constitutional stipulation requiring oil producing states to establish an independent commission to manage the state’s share of oil revenues derived from the 13% derivation fund. Unresolved questions of continuing illegality and a total lack of accountability for the state’s huge monetary allocations continue to fuel anger among indigenes of the state. Without any prior assessment of the extent of damage, and without holding any meaningful consultation with affected persons and communities, Mobil unilaterally announced an offer of N26.5 Billion Naira. How Mobil arrived at that compensation sum is still a mystery to industry watchers and communities alike. Tossing figures like carrots at polluted communities is consistent with the entrenched culture of impunity which has seen oil companies view paying compensation for oil spills as acts of charity or benevolence to communities they have wronged. In the same way, it is this often unchallenged impunity that makes them treat community demands for justice and accountability with distasteful condescension, and and consider them as “disturbance” to oil flow and production. The situation in Eket is another sad example of unbridled corporate impunity that must be overturned in the Nigerian oil and gas sector. It further makes a strong case for the need to urgently reform the Nigerian oil regime, tightening and strengthening laws that protect the environment and expand community access to justice. Participants at Spaces for Change’s conference comprised mainly of paramount rulers and clan heads of Mobil’s host communities, youth and women leaders, industry regulators, state officials, representatives of fishing associations and over 22 Akwa Ibom communities. Substantiated participants’ testimonies disclosed that Mobil’s oil and gas installations are generally dilapidated, old and prone to leakages and recurrent spills. With its exploration and production facilities predominantly offshore, located in the depth of the high seas, this excludes the possibility of willful interference and sabotage; a regular defence oil companies rely on, to evade responsibility for their frequent wrongdoing. It also took several community protests to force Mobil to announce the volume of oil spilled in November 2012, which it fallaciously pegged at 200,000 barrels of oil. Mobil’s failure to promptly notify communities about the spill further occasioned a time lag between the when the spill occurred, and when locals and regulators became aware of it resulting in extensive damage to fisherfolk and contamination of water, fishing and food sources. Ms. Idorenyin Phillip, a fisherwoman from Odio community – an Island which hosts Mobil’s flow-stations and oil rigs – testified of substantial destruction or extinction of the marine plants and plankton which sustain the ecosystem, thereby rendering the water uninhabitable for fishes. Among a range of community concerns highlighted at the event, Emen Daniel, the Chairman of the Onna Youth Council wondered why Mobil will travel as far as Dallas to hire expatriates who render non-technical services that can be sourced locally from the host communities. Consequently, unemployment is rife, triggering restiveness among local youths who in turn make it difficult for oil companies to operate with minimal disruption. This is a vicious cycle, one that is totally easy to contain, but tactlessly left to spiral out of control. In a clime where standards are respected, and where regulatory bodies bark and bite, the current standoff at Eket would have been totally avoidable. There is scant evidence showing that steps were taken to avert the mounting social tension. Irvine Obot, the Zonal Coordinator of the National Oil Spill Detection and Response Agency (NOSDRA) confirmed that investigation into the November spillage has not been concluded and erring companies have not been punished. Failing to conduct a conclusive investigation one year after an incident that devastated the ecosystem upon which local farmers and fishermen depend on, amounts to a regulatory failure on the part of the Nigerian government. On the hand, waiting to be railroaded into positive action by means of sustained protests and operational shutdowns is an irresponsible business strategy, bereft of ethics of social responsibility, on Mobil’s part. For decades, it has been notoriously difficult for communities to bring and sustain legal actions against powerful corporations. Overwhelming evidence also shows that the volatile situation in the Niger Delta is in large part, attributable to the large-scale environmental degradation linked to weakly-regulated oil production activities, which continue to increase indigenous communities’ vulnerability to food shortages, health hazards, loss of land and livelihood resources, forced migration, unemployment and so forth. But the recent PIB recognizes that oil operations (including seismic operations, mining, oil spill resulting from equipment failure, human error, corrosion etc) can cause damage to private property rights, the natural vegetation and the human habitat, and therefore, contains robust preventive and remedial provisions in event of breach. The reform bill is being seen as a step towards international corporations being made accountable for their environmental and social actions. Helped by Spaces for Change’s PIB Resource Handbook which contains a detailed analysis of the PIB provisions relating to community participation and the environment, Akwa Ibom communities have been empowered to understand the PIB, and take active part in efforts to develop stronger and effective policies to regulate the oil and gas sector. “We want the National Assembly to pass the PIB so that oil-devastated communities can use the new regulations to demand legal protection from environmental injustices and corporate impunity”, says His Royal Highness, ECD Abia, the clan head of Eket. Will the PIB be passed soon? Will the raging protests and current disruptions jolt Mobil Producing Nigeria out of complacency, to the point of starting to seriously consider the social and environmental impact their operations may have on communities in which they operate? Will the government of Akwa Ibom State also seize the opportunity to address the range of legitimate questions regarding the illegality surrounding its handling of both the derivation fund and the Mobil compensation quagmire? As the center stage begins to take more insidious dimensions and approaching a point that will soon be difficult to repair, industry watchdogs like Spaces for Change are keenly monitoring the developments, with the hope that all the key actors involved will do the right thing, NOW! The Star People convened a Sacred Circle on the Moon and are going to start a war against Poverty, Disease and Despair.